Welcome to the Lily Pad Cards’ First Birthday blog hop! 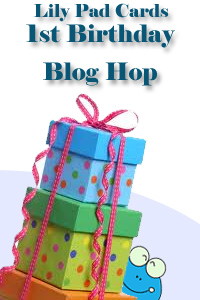 If you are following all blog hop links, you should arrive here from Ayana's blog. I stamped a background using Darkroom Door's Frangipani Photo Stamp and my homemade multicolored inkpad. I stamped and heat embossed Hero Arts Frame with Scrolls. 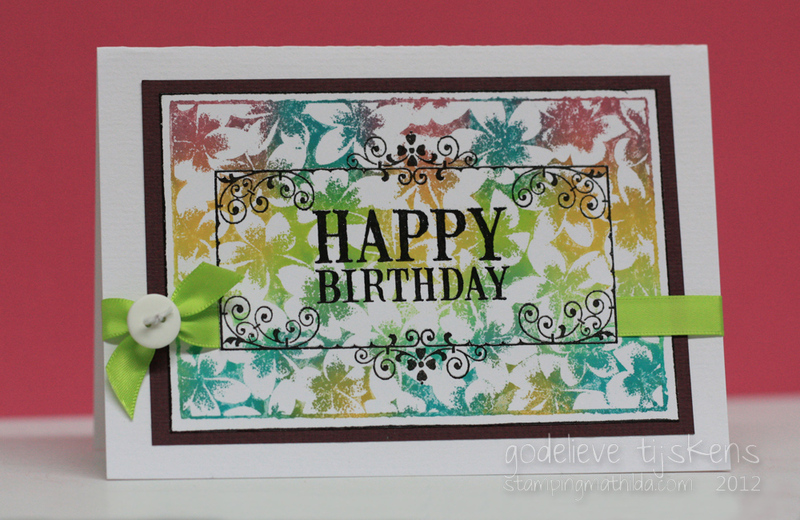 I only inked "Happy Birthday" on Darkroom Door's Birthday Word Block Stamp, stamped and heat embossed. If you hit a bad link, you can always go back to the Lily Pad to view the master list of blog links. Please report any bad links to aris@inlinkz.com. 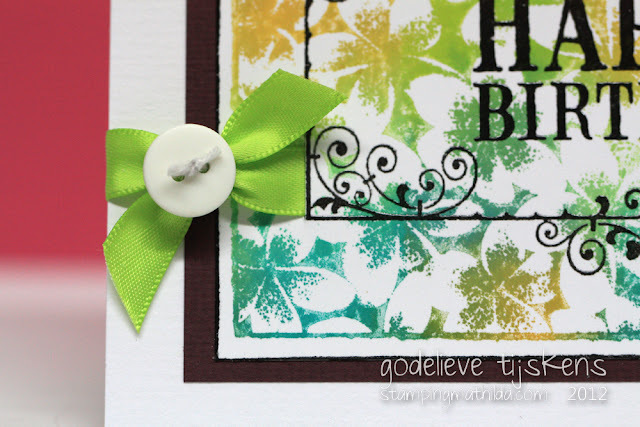 Welkom op Lily Pad Cards Verjaardag Blog Hop! Als je de links van de blog hop gevolgd hebt, kom je nu van Ayana's blog. Om de eerste verjaardag van Lily Pad Cards blog te vieren, worden er drie prijspakketten willekeurig verloot, met een totale winkelwaarde van meer dan $300! Om te kunnen winnen moet je ons "liken" op Facebook of, als je geen Facebook account hebt, door een reactie achter te laten op Lily Pad Cards blog. En met elke reactie die je de komende week op de deelnemende blogs achterlaat, inclusief bij de Lily Pad, verhoog je je kans om één van de winnaars te worden. Maar 1 reactie per blog aub. De achtergrond van mijn kaartje voor deze gelegenheid, is gestempeld met Darkroom Door's Frangipani fotostempel, met mijn zelfgemaakt veelkleurig inktkussen. Het kadertje van Hero Arts (Frame with Scrolls) is gestempeld met Versafine #Onyx Black en geëmbossed. 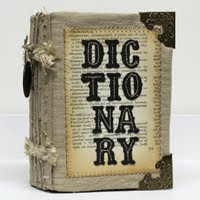 Voor de wens gebruikte ik de Birthday Word Block stempel van Darkroom Door, maar plakte die gedeeltelijk af voor het inkten. Mocht er ergens een link niet werken, dan kan je altijd bij Lily Pad de volledige bloglijst zien. Patricia Rey april 01, 2012 4:20 p.m.
Jane april 01, 2012 4:35 p.m.
Gayatri april 01, 2012 4:37 p.m.
JOAN april 01, 2012 4:47 p.m.
Heidi april 01, 2012 4:48 p.m.
Jackie april 01, 2012 5:03 p.m.
Wow, that is gorgeous! I love that stamp and the colors are so pretty. Great idea for a background, I had forgotten all about that technique. gRiSeL™ april 01, 2012 5:20 p.m.
Heather Maria april 01, 2012 5:23 p.m.
Gorgeous card! I love the wonderful, colourful background and the embossed frame and sentiment are beautiful! Vicky april 01, 2012 5:26 p.m. Such a beautiful and elegant card! Love this technique! Thank you for celebrating with us! Hillie april 01, 2012 5:39 p.m.
Karin (PeppermintPatty) april 01, 2012 5:53 p.m. Your card is absolutely FABULOUS! 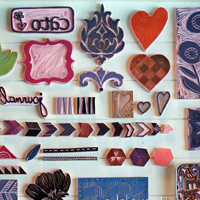 - wonderful stamping - Love it! Anneke april 01, 2012 6:06 p.m.
Superkaart voor deze gelegenheid! En weer gemaakt met je tover inktkussen, mooi! Het lijkt een one layer maar als ik naar het lintje kijk twijfel ik. Inspirerend idee om een deel van de tekststempel af te plakken. judkajudi april 01, 2012 6:15 p.m. The background is amazing; shows off that sentiment perfectly! Kelly Massman april 01, 2012 6:15 p.m.
Marleen Derweduwen april 01, 2012 6:25 p.m.
Cornelie april 01, 2012 6:53 p.m.
O, wat vind ik h'm mooi!! conil april 01, 2012 7:10 p.m.
Love the color and technique on this card. Beautiful. judy april 01, 2012 7:41 p.m.
Beautiful card; I love the multi-colored background!! Alie Hoogenboezem-de Vries april 01, 2012 7:41 p.m.
Cher april 01, 2012 7:43 p.m.
oh this is a wonderful card..ty for telling me HOW..luv that!over the top PRETTY! Leslie C april 01, 2012 7:48 p.m.
Beautiful card. Thanks for the chance to win! One Scrappy Gal april 01, 2012 8:04 p.m.
Love that background! Lovely card. Jenni april 01, 2012 8:15 p.m.
Oh wow, Godelieve, this is beautiful! I love your homemade inkpad, such beautiful colours. This card looks so pretty, I love the way it changes the look of the background too, so different to the monochrome! Riette april 01, 2012 8:35 p.m. This is an amazing card. I love how you tucked the ribbon into the card front! Very clever.Great to celebrate with you on the hop! Deirdre april 01, 2012 8:39 p.m.
Amazing card - love the stamping and embossing - fab. Denise Bryant april 01, 2012 8:39 p.m.
Fabulous card! I love your homemade inkpad idea.... lovely colors! And that Hero Arts frame stamp has been on my wish list for awhile! love it! pcm april 01, 2012 8:58 p.m.
Christa april 01, 2012 9:25 p.m.
Nan april 01, 2012 9:27 p.m.
Melissa Shea april 01, 2012 9:35 p.m.
diana april 01, 2012 9:46 p.m.
Dixie Cochran april 01, 2012 9:47 p.m. I love the design of this card. So clever! Kathi april 01, 2012 10:02 p.m. Absolutely stunning! Home made rainbow pad? Katie april 01, 2012 10:18 p.m.
Oh wow! Genius idea of coloring the stamp pad. I'm excited to try that, I wonder if it works with other inks like distress? You got me thinking. You've gained a new follower. Thank you so much for your inspiration. luluvision april 01, 2012 10:35 p.m.
love the handmade stamp pad color! Great card! Michelle Lupton april 01, 2012 10:45 p.m.
Nancy april 01, 2012 11:08 p.m.
What a perfectly gorgeous card! That background is so amazing, it's wonderful with the simply stamped sentiment and frame. This is such a classy design, I love it! Anjas-Artefaktotum april 01, 2012 11:16 p.m.
Love the colorful background, beautiful birthday card! Jan april 01, 2012 11:18 p.m.
Gotta love handmade ink pads. Very simple but elegant. Karen Letchworth april 01, 2012 11:42 p.m. Your card is elegant, sophisticated and just plain beautiful! Thanks for sharing your art and being part of this wonderful blog hop to celebrate at Lily Pad Cards. 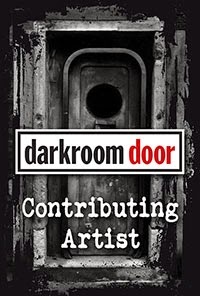 I just love their blog, and appreciate all of you for participating in the hop. My frog legs are tired from hopping lily pad to lily pad. Thanks for your efforts, and for sharing your beautiful art for Lily Pad Cards. Chelsea april 02, 2012 12:14 a.m.
Annan april 02, 2012 12:34 a.m. Your card is beautiful! Love the colors and the simple uncluttered design. Sherry april 02, 2012 1:17 a.m.
Cathy A april 02, 2012 1:19 a.m.
Theresa april 02, 2012 1:25 a.m.
Beautiful, beautiful card!!! LOVE the background! osirisandloki april 02, 2012 1:35 a.m.
Miriam Prantner april 02, 2012 1:57 a.m.
Great card! Love that background and your multi-colored stamp pad! stylesplenty april 02, 2012 2:09 a.m.
Barb Ghig april 02, 2012 2:36 a.m.
What a great idea to have a home made multi-color ink pad...and your card is absolutely stunning!!! forpahl5 april 02, 2012 2:41 a.m.
great card! how did you make the ink pad? Godelieve april 02, 2012 7:55 a.m.
Suzanne C april 02, 2012 2:41 a.m.
Beautiful rainbow of colors! Lovely design. Rebecca King april 02, 2012 2:50 a.m.
Super card!!! Love all the colors!!! Cheryl S. april 02, 2012 3:27 a.m. This card has so many textures and details...very nice! cassie april 02, 2012 3:48 a.m.
Mubeena M. april 02, 2012 4:12 a.m.
Delightful Designs by Katherine april 02, 2012 4:42 a.m.
cmatthews april 02, 2012 5:11 a.m.
Love the pattern you created. Is fab! Kara Lynne april 02, 2012 5:31 a.m. This is such a unique inking. I love that it's your own creation. The close up of the sentiment really shows your details well. Holly AKA KopyKat april 02, 2012 6:10 a.m.
Kristie Maynard april 02, 2012 6:16 a.m. Very nice card. Love the colors! Melissa D april 02, 2012 6:21 a.m. The home made inkpad has obviously been very effective for you. Love the background and the sentiment really works well on it. marie april 02, 2012 6:26 a.m.
Virginia L. april 02, 2012 6:57 a.m. Absolutely stunning! Awesome card on the Lily Pad birthday celebration!Thank you for sharing your talent! Disp6194 april 02, 2012 7:17 a.m.
donna mikasa april 02, 2012 8:22 a.m. Such a beautiful card, Godelieve! I love your custom colored stamp pad! Laurie april 02, 2012 9:27 a.m.
Beautiful card, your embossing is perfect! Susan april 02, 2012 10:13 a.m.
Prachtige kaart! Net als de anderen :) Ik kom bijna elke dag even kijken op je blog en elke keer weet je me weer te verbazen. Cheryl april 02, 2012 10:47 a.m.
How pretty! Your background is magnificent! CinnamonSally april 02, 2012 10:53 a.m. This card is so pretty Matilda and I love your idea with the stamp pad, I am going to have to give this a try!! rossi73 april 02, 2012 1:34 p.m.
Lovely card! I had to check out your multicoloured ink pad...I will be keeping my old versamark ink pad and trying that! Isha april 02, 2012 3:23 p.m.
Valentina april 02, 2012 3:34 p.m. I really like the "multicolor" background. Debbie april 02, 2012 3:39 p.m. I love the background on this stamp, beautiful! Anoniem april 02, 2012 3:48 p.m.
Kelly Booth april 02, 2012 4:05 p.m.
Maureen Morton april 02, 2012 4:30 p.m.
Love this amazing background and it was interesting so see how you made the ink pad - most creative! This card is so elegant and fun at the same time. Thanks for sharing. Alina april 02, 2012 4:36 p.m.
elizabeth april 02, 2012 5:14 p.m.
Cindy C. april 02, 2012 5:49 p.m. Wonderful card, love that background! TFS. Meagan april 02, 2012 6:50 p.m.
Sharon Roselli april 02, 2012 6:55 p.m.
beautiful card! love the colors and details. Cassie_lu april 02, 2012 7:22 p.m.
Holly Saveur april 02, 2012 8:20 p.m.
Hele mooie kaart..de vorige van Art Journy vind ik helemaal het einde ,wat een leuk idee..de vingerafdruk om daar vogeltjes van te make..echt super! Anoniem april 02, 2012 8:21 p.m. I love the beautiful bright colors and how the ribbon just slips through the bottom of the card like that. Luanne april 02, 2012 8:54 p.m.
Jan Garber april 02, 2012 9:39 p.m.
How beautiful! I have a note to myself to make a multi-color pad of my own as soon as I finish this hop! Thanks! Mariëtte april 02, 2012 10:20 p.m.
Nina Yang april 02, 2012 10:55 p.m.
Lagene april 02, 2012 11:06 p.m.
Tracey april 02, 2012 11:14 p.m.
zehra april 03, 2012 12:12 a.m.
Betty april 03, 2012 12:31 a.m.
beautiful card - love the frame on top of the colors and the embossed stamping! Sherri april 03, 2012 12:57 a.m.
marla april 03, 2012 1:19 a.m.
Amazing card. Love the technique!! Just 4 Fun Cards april 03, 2012 1:42 a.m.
Gorgeous card - the homemade stamp pad worked so well. I love that frame stamp! Karen Diebolt april 03, 2012 4:12 a.m.
NWFlamingo april 03, 2012 4:39 a.m.
Kris april 03, 2012 5:33 a.m.
Beautiful card! Love it! Thanks for sharing. Jenny McGee april 03, 2012 3:12 p.m.
Marie / Legojenta april 03, 2012 9:20 p.m.
Oh, pretty! Love the multicolored background =) TFS! Kelly april 03, 2012 10:41 p.m.
kyhunter april 03, 2012 10:52 p.m. The ribbon and button gives the card more dimension. Very nice! Raven april 03, 2012 11:19 p.m.
Brooke april 04, 2012 12:29 a.m.
A Crafty Person april 04, 2012 2:01 a.m. Wonderful card! The background is stunning. Emily H april 04, 2012 2:27 a.m. I love the colors! How did you do this? Godelieve april 04, 2012 6:35 a.m.
Paper Therapy Ponderings april 04, 2012 2:51 a.m.
LindaChad april 04, 2012 3:18 a.m.
Sue D april 04, 2012 3:32 a.m. Fantastic card--I like the background and the embossing. Wee Von april 04, 2012 3:45 a.m.
Anabé april 04, 2012 4:01 a.m.
Divya@The Craft Angel april 04, 2012 4:38 a.m. Such an elegant card! Wonderful embossing. Cecilia Hsieh april 04, 2012 4:47 a.m.
Another beautiful card! Love the homemade inkpad - I'm dying to try it on Cut and Dry Felt and Distress Re-inkers. TFS! Anoniem april 04, 2012 5:53 a.m. I love the little details on this card that make it so beautiful! Very nice! Kawaii~Saru april 04, 2012 8:58 a.m.
Wow this is awesome! I love how you stamped the background! Amazing! Hilde van Rijnsoever april 04, 2012 11:58 a.m.
Erg mooie kaart! Love the colors! Vicki april 04, 2012 3:58 p.m.
mtscrapgal april 04, 2012 10:00 p.m.
Brenda B. april 05, 2012 1:02 a.m.
Vicki Dutcher april 05, 2012 1:24 a.m.
luv2scr@p april 05, 2012 2:09 a.m.
Melissa april 05, 2012 3:04 a.m. This is a beautiful card! I love how you did the background with all those colors! Brenda april 05, 2012 5:07 a.m.
OMG! I love that background, it is perfection! Such beautiful colors! lisa808 april 05, 2012 5:42 a.m.
Flo - Sweetideas april 05, 2012 4:02 p.m.
Love your card, it is very lovely. I also love visiting your blog. Such great ideas and projects. Laura Jane april 05, 2012 5:22 p.m. I like how you have the ribbon going behind the sentiment box. Cindy april 05, 2012 6:49 p.m.
Lovely card and ribbon idea! Thanks! Cara april 05, 2012 8:38 p.m. I love your colorful background. It is beautiful! Mary-Anne V april 05, 2012 8:45 p.m.
Super card...love how you created the look with your ink pad. Sue Bridges april 06, 2012 1:52 a.m.
Daria Z. april 06, 2012 2:58 a.m.
Beautiful card! And I love how you made your own inkpad! ~ Jo ~ april 06, 2012 3:09 a.m.
Betty J Schaub april 06, 2012 7:27 a.m.
Lovely. I esp. like how you attached the ribbon. It's invisible! Susan F. april 06, 2012 8:25 a.m.
Janet a.k.a. swanlady21 april 06, 2012 9:27 a.m.
Love that background you created. So pretty. onecraftymama april 06, 2012 11:42 a.m.
N@ april 06, 2012 5:06 p.m. Happy Birthday Lily Pad Cards! Great card, love your multicolored inkpad! AmberSkye april 06, 2012 7:17 p.m.
pamselinski april 06, 2012 9:00 p.m.
A very beautiful card. That background is stunning. Mom to Deanna april 07, 2012 1:28 a.m.
Love the backround stamping, very colorful! Lucy Newton april 07, 2012 2:40 a.m.
AmyJ april 07, 2012 2:45 a.m.
Beautiful card. Loving the colors. Vicky april 07, 2012 4:15 a.m.
Just love how you put the ribbon behind the sentiment. The colors are really cute. missstamper april 07, 2012 4:29 a.m.
Gorgeous colors and a beautiful card! CanadianScraps43 april 07, 2012 5:01 a.m.
Wow your card is beautiful. 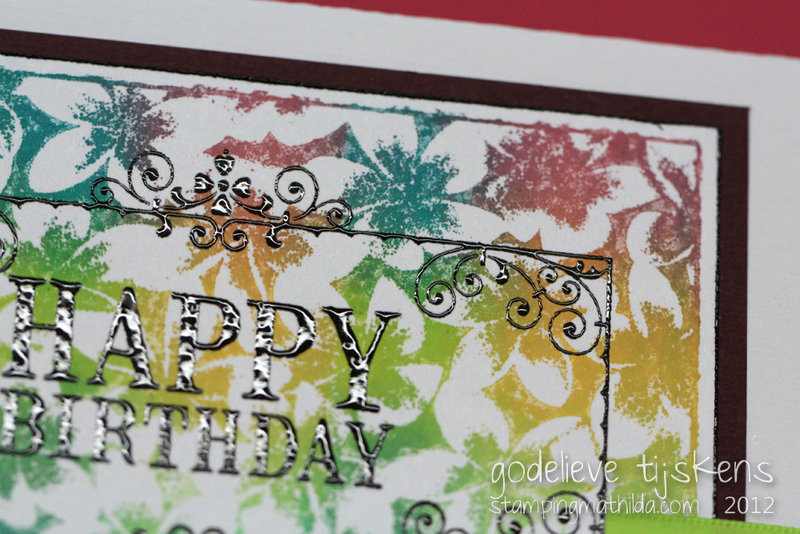 The variety of colour and stamping makes it stand out from the rest. Wow. I have admired your cards in our HA flickr group from some time and this one is no exception. Your eye for detail and design is outstanding. Your ability to make every card an individual performance is so amazing for the audience having the priviledge to attend such a show. Hats off on mastering the art of cardmaking. cheap upc codes april 07, 2012 1:31 p.m. I just like this first card the colours used for the stamp are perfect and that background script paper really caught my eye. I like how you have the ribbon going behind the sentiment box. rlovew april 07, 2012 3:17 p.m. I love your background that you made using the multicolored pad and the stamp! maria f. april 07, 2012 5:53 p.m.
Great combination of techniques for a lovely result. Scrapbookdoll april 07, 2012 5:53 p.m.
Dat is een heel mooie kaart! Het is een heel leuke techniek dat je gebruit hebt. Crystalena82 april 07, 2012 7:58 p.m.
Ellen april 07, 2012 8:10 p.m.
Yvette april 07, 2012 8:54 p.m.
Weenie Thomas april 08, 2012 1:17 a.m.
Heidi May april 08, 2012 3:43 a.m.
what a beautiful card. Love the embossing. thank you for sharing. Angel april 08, 2012 5:22 a.m.
Robyn april 08, 2012 6:20 a.m. Very pretty card! Thank you for sharing. Anoniem april 08, 2012 6:22 a.m. This background is simply AMAZING! Camilla april 08, 2012 12:43 p.m.
Wow, the background is stunning! Love the embossed accent on top of it. Mrs. Hill april 08, 2012 9:04 p.m. This is LOVELY! I just love the multiple colors for the flower background. The black stands out so well against the color, even the delicate scrollwork of the frame. Simple and striking! Kelly april 08, 2012 11:03 p.m.